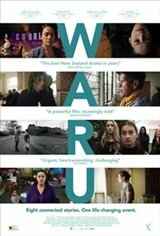 From nine female Maori filmmakers come eight connected stories, each taking place at the same moment in time during the tangi (funeral) of a small boy, Waru, who has died at the hands of a caregiver. The eight stories are all subtly linked and follow different female characters as they come to terms with Waru's death and try to find a way forward in their community. In Maori, waru means 8.